The Canadian government is very strict on it's passport photo requirements and should only be taken by professional photographers such as ourselves. You must submit two (2) identical photos with each passport application. 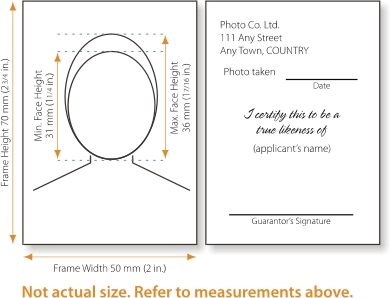 The ﻿Government of Canada﻿ recommends that passport photos be taken with a neutral expression for use with facial recognition systems - advanced technology that helps prevent fraud by electronically verifying identity based on each person's unique facial features. the name and complete address of the photo studio and the date the photo was taken. The photographer may use a stamp or handwrite this information. Stick-on labels are unacceptable. Glasses, including tinted prescription glasses, may be worn in photos as long as the eyes are clearly visible and there is no glare in the glasses. Sunglasses or photos where there is the red-eye effect are unacceptable. Photos must show the child's head and shoulders only. Parent's or child's hands must not appear in the photo. Passport Canada recognizes the difficulty in obtaining a neutral expression of a newborn and will allow for some tolerance in this regard. For newborn babies, the photo may be taken while the child is sitting in a car seat, as long as a white blanket is placed over the seat behind the child's head. There must be no shadows on the face or shoulders, around the ears or in the background. If applying for a one-time replacement passport for a child, you must include a photo that has been taken within one month of the date the application is submitted.